Records show there has been a church dedicated to St Andrew in Tangmere since 680 AD, shortly after St Wilfrid brought Christianity to Sussex. The present building dates from the early 12th Century. A modest extension was added to form the sanctuary in the 13th Century and it had a gallery which was removed when considerable renovation was carried out. In spite of these renovations the Church building today still stands as a simple country church, essentially as it was in medieval times. The font is a relic of Saxon England. While the windows of the nave are 12th and 13th century (round headed with a single lead light and unglazed until the middle of the 19th century), the stained glass dates from the Victorian era. On the west wall is the millennium window, designed to commemorate the pilots of World War II. The roof timbers are well over 800 years old. Two of the three bells in the bell-cote are from the 15th century and the third is by the famous John Cole, dated 1575. The chancel and sanctuary, reached through an attractive 13th century arch, contain further 13th Century features, such as a piscina (used in the celebration of the Mass), a 15th Century stone reredos and a rare altar stone bearing the well known marks of five crosses, representing the five wounds of the Crucifixion. 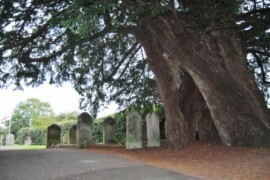 A yew tree which is probably older than the church itself. Under the tree are a number of unusual 18th and early 19th century barrel graves, made from wedge shaped bricks. 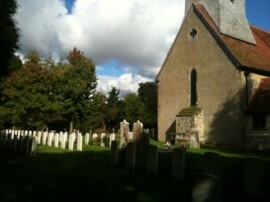 The reason for these is unknown, but records show that they cost 7/6 (about 35p) more than ordinary graves. Near the window on the south side (close to the porch) is an Anglo-Saxon carving, possibly pagan, in low relief. St Andrews was restored in 1845, with further adjustments in 1924, the 1980’s and after the 2003 lightening strike. This led to major refurbishment of the floor, replacement of the Victorian pews and restoration of the stained glass windows. More recently, a Victorian storeroom was extended and turned into a small kitchen and wheelchair accessible toilet.